Last Monday our class had the chance to visit Steam Whistle Brewing located at the historic John Street Roundhouse, downtown Toronto. The roundhouse was built between 1929-31, but is no longer operational. It now stands as a historic landmark where people can visit the Toronto Railway Museum, take a ride on the miniature railway that loops around Roundhouse Park, or enjoy a picnic on a sunny day. 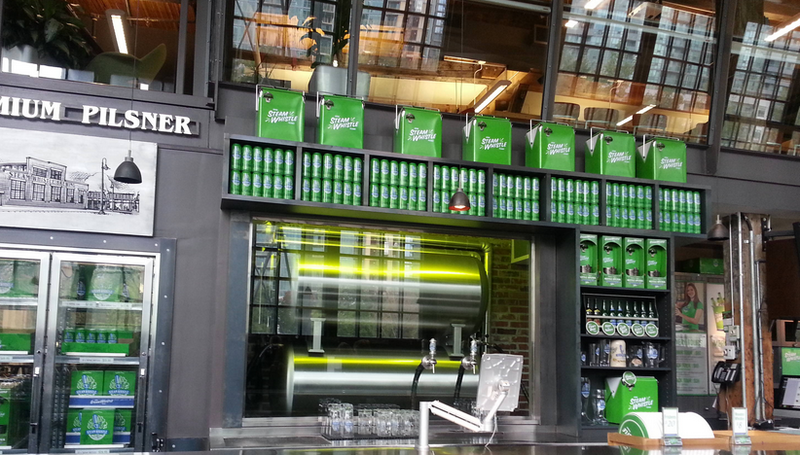 The Steam Whistle Brewing Entrance. 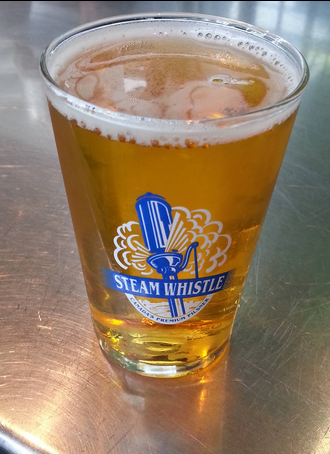 Steam Whistle Brewery, open 363 days of the year is a craft brewery, specializing in premium pilsner lager. The company brews, bottles and sells their product right on premise (although it can be found at most LCBOs and Beer Stores around Ontario and in other parts of Canada). Steam Whistle was founded by three friends who were left unemployed after the brewery they worked at suddenly shut down. They decided to go into business together and named their brewing company “Three Fired Guys”. 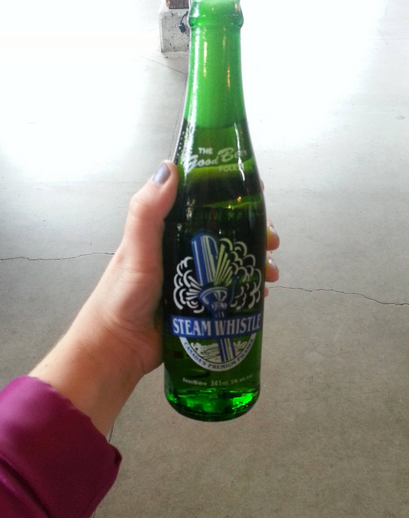 The name didn’t strike a cord with everyone so the changed the name to “Steam Whistle Brewing”. They chose the name because the steam whistle is an iconic symbol for the end of the day when you punch out of work, kick your feet up and have a cold one. Fun fact: On every bottle of Steam Whistle there is an embossed stamp “3FG”. This inside joke pays homage to their company’s former name. Iconic Steam Whistle bottle with 3FG stamp. The microbrewery offers tours daily; you get the chance to see the process of how their beer is made as well as tour the beautiful facilities. On our tour we had the chance to find out what ingredients go into making the beer (spring water from Caledon, hops from Germany, yeast and barley). We also had the chance to see how the pilsner was bottled. 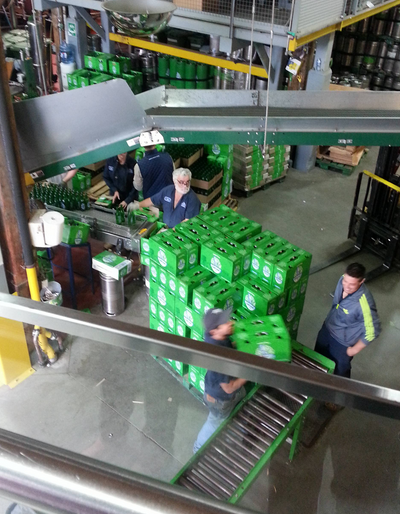 I even got the chance to pull the steam whistle that bellows daily, once an hour. After the tour my class had a chance to tour the building, which is beautiful inside and out, with its exposed brick and originally wooden beams. 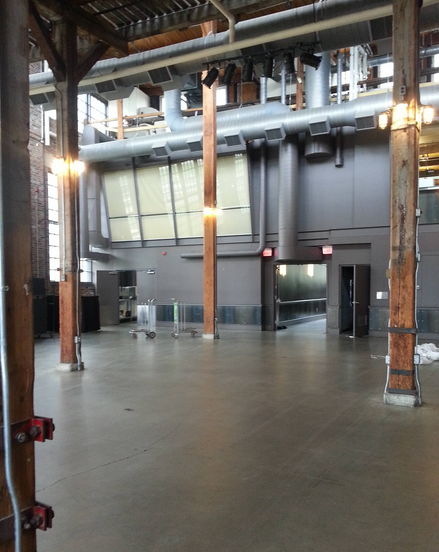 It makes for a really unique event space for a variety of events. They host weddings, corporate events, private parties and charity fundraisers. They even hold concerts in the main hall from time to time! Main hall with original exposed beams. At the end of our tour Adam Weed, Senior Events Manager, talked to us about the types of events they hold, what makes Steam Whistle a unique venue and a bit more about the history of the company. Overall, it was a great tour. I learned a lot about the company, the beer and the venue. At the end of the tour we were treated to a beer tasting. This was definitively my favourite part of the day! A nice cold one at the end of our tour.